Winnie Sue Warren, 85 of Choctaw, Oklahoma surrounded by her family, slipped peacefully free of her earthly chains of illness and suffering on January 12, 2019. Born on July 25, 1933 in Cloud Chief, Oklahoma to Royce M. and Susie B. (Piercey) Scoggin , Sue was a 1952 graduate of Choctaw H.S. and a lifelong resident of the city of Choctaw. 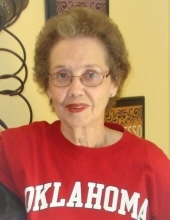 Susie will be remembered for her quick wit and sense of humor and her enormous love for family, all things OU, the Thunder, Elvis, and a good burger with pickle, onion, and mustard only, please! She was preceded in death by both her parents, and her husband, James O. Warren of 54 years; sister, Joyce Strawn; brother, Melvin Scoggin; brother, John Redenti; brother- in- law, Don Strawn; and nephew, Tom Bourlon. Sue is survived by her son, Mike Warren and wife, Janet of Choctaw; daughter, Cindy Speir of Choctaw; niece, Dona Bourlon of Choctaw; and sister, Rosemarie Ranowicz. She is also survived by 3 granddaughters; Angie Cloer and husband Scott; Ashley Thomas and husband, Rocky; and Amber Conner; as well as 6 great-grandchildren: Cade Thomas, Creed Thomas, Macy Cloer, Campbell Cloer, Sutton Cloer, and Carson Conner and her beloved and faithful pet, Roxi. The family would like to thank all of the care givers from Encompass Health and Hospice and Care Plus Home Care. Services will be held at the Barnes and Friederich Funeral Home in Midwest City, OK. on January 16, 2019 at 2:00 P.M. with interment to follow at Arlington Memory Gardens, 3400 N. Midwest Blvd. Okc. Ok.
To send flowers or a remembrance gift to the family of Sue Warren, please visit our Tribute Store. "Email Address" would like to share the life celebration of Sue Warren. Click on the "link" to go to share a favorite memory or leave a condolence message for the family.